Open edition of signed and numbered gold on red Vajrakila screen prints available in A3 size (16 x 12.5 inches). Vajrakila, the 'indestructible dagger', is one of the eight wrathful yidam or meditational deities of the Nyingma oral Mahayoga transmissions, where he is recognized as the wrathful aspect of Vajrasattva, and is affiliated with the Karma Buddha Family of Amoghasiddhi. His practices are designed to remove both inner and outer obstacles, where the inner obstacles are essentially the afflictive emotions of egoism, and the outer obstacles are the negative forces that are eliminated through the performance of the four rites of: pacification, enrichment, subjugation, and wrath. Vajrakila is extremely wrathful and blue-black in colour, with three faces, four legs, and six arms. He stands in alidha posture leaning towards the right upon a corpse throne, a golden sun disc, and a multicoloured lotus that rests upon a vajra-rock foundation. With his two right feet he tramples upon the forehead and back of Rudra (Mahadeva), while with his two left feet he tramples upon the breasts of Rudra's consort, Rudrani. These two figures may appear wearing a tiger-skin (Rudra), and a leopard-skin (Rudrani), with each holding the attributes of a skull-cup and a curved knife. Vajrakila's four feet symbolize the four activities of: pacifying, enriching, subjugating, and destroying. Vakrakila's three faces are white (right), black (centre), and red (left), and represent his triumph over the three poisons of ignorance, aversion, and attachment. Each of his faces are extremely fierce, with three round and angry red eyes, upward-blazing facial hair, and a gaping mouth that reveals its four fangs, sharp teeth, and twisting red tongue. Each of his heads is adorned with a five-skull crown, and upward-streaming tawny hair, which is sealed by a black half-vajra bound by a small snake at the crown of his head. His powerful body is adorned with the 'ten attires of the charnel grounds', which are: his forehead, cheeks and chin are respectively smeared with cemetery ash, fresh blood, and human fat; a flayed and bloody elephant-skin is stretched across his back; he wears a human-skin shawl, and a tiger-skin loincloth; he wears a garland of fifty freshly severed heads; his limbs and body are adorned with small serpents, and a long green serpent that serves as his sacred thread. Together with his mighty vajra-wings and the blazing mass of wisdom fire that surrounds him, these complete the ten attires of the charnel grounds. With his first two right and left hands he embraces his consort, while he rolls or rotates a ritual dagger with three triangular blades or faces, which represent the transmutation of the three poisons of ignorance, attachment, and aversion into the three supreme nectars of wisdom, compassion, and power. 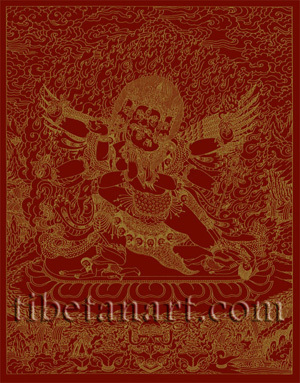 With his other two right hands he holds a five-pointed golden vajra, and a nine-pointed golden vajra with wrathful open prongs. With his upper left hand he makes the threatening tarjani gesture, with a blazing mass of wisdom fire emanating from the palm of his hand. And with his lower right hands he holds a trident-khatvanga. He is embraced by his female consort, Diptachakra (Tib. khor-lo rgyas 'debs ma), the 'blazing wheel', who is a lighter tone of dark-blue in colour, with one face, two arms, and two legs. In sexual union she presses every part of her body against her lord, with her left leg wrapped around his waist, and her right leg outstretched. She wears a leopard-skin loincloth, the five bone ornaments, and a long garland of fifty dry white skulls. Her fierce face has three round red eyes, and a gaping mouth that reveals her sharp fangs and twisting tongue, and she inclines her head sharply to her right with her eyes passionately fixed upon those of her lord. With her left hand she holds aloft a skull-cup filled with fresh blood, and with her right arm she embraces the neck of her lord while holding a blue lotus flower in her hand. In certain other traditions she may hold a khatvanga, a wheel, or a bell in this hand. She wears a five-skull crown upon her head, and her long black hair hangs freely down her back. In the foreground of this drawing's wrathful surrounding landscape is the central wrathful offering of the five torn-out sense organs, consisting of: a heart (touch), a tongue (taste), a nose (smell), ears (sound), and eyes (sight). On either side of this are two skull-cups containing swirling blood (left) and nectar (right). And outside of these are a conch shell filled with perfume, and a skull-cup containing a torma or sacrificial cake offering to the wrathful deity Vajrakila.